He is without any doubt and will always remain one of the most famous names in British Wrestling and yet it is hard to believe that the legendary masked star known worldwide as Kendo Nagasaki celebrated 50 illustrious years as a professional wrestler on the 13thNovember 2014. 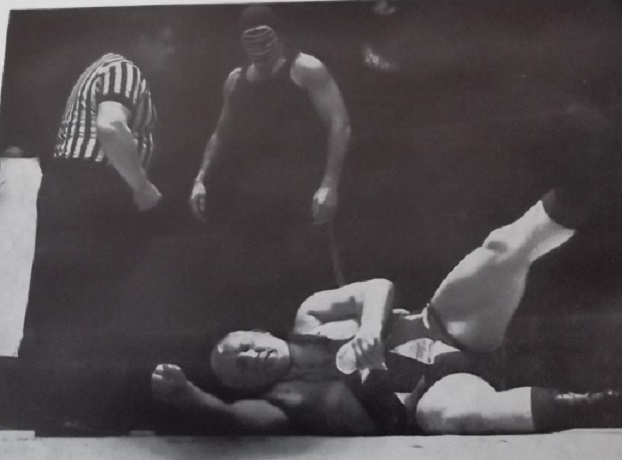 Kendo made his professional debut at Willenhall Baths against one of the eras biggest stars in Jumping Jim Hussey (the father of Rollerball Mark Rocco who Kendo would go on to have a feud with twenty years later). This was a huge bout for even the most experienced wrestler let alone a newcomer to the business but Kendo showed no fear of the bigger man. This first bout was the start of what was to become one of many top matches that Kendo would participate in and he was soon travelling up and down the UK wrestling the top stars of the day making a name for himself wherever he went as well as gaining experience in the ring. As time went by certainly made promoters sit up and take notice at what a future star they had on their hands. In 1966 Kendo was to face his biggest challenge at that time when he stood across the ring from another masked man in Count Bartelli. 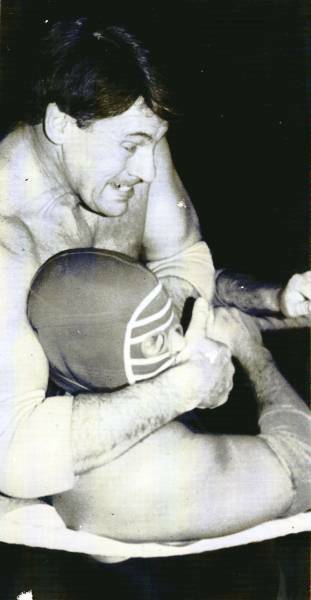 Bartelli had been one of the greatest masked wrestlers for over 20 years but was now being seriously challenged for this crown by the young up and coming Kendo. Bartelli and Kendo had been seen in UK rings in tag team bouts and had a great deal of success, infact nobody could beat them but a falling out between the two men of mystery set up this solo contest. The bout finally took place on Saturday 5th March 1966 at the Victoria Hall in Hanley before a sold out crowd with many other fans unable to get into the building to witness this unique match. The bout was evenly matched throughout and nobody in attendance could have picked a winner, either wrestler could have secured the win but it was Kendo who ended up triumphant after Bartelli failed to beat the referees count, the career of the UKs most famous masked wrestler was over and it was only the beginning of a legends career as this bout firmly put Kendo Nagasaki on the map. The Bartelli bout had made Kendo one of the biggest names in British wrestling, he was now topping the bill and facing many of the top heavyweights of the day, infact it was reported that during this period he was the top heavyweight in the UK but due to his secret identity he was unable to challenge for the British Title although many believed he would have certainly captured the belt if he had been allowed to wrestle for it. It was not until 1971 that Kendo was given his first taste of national stardom when he participated in his first televised appearance from St Albans. The bout was aired on the 8th May and the masked man defeated Wayne Bridges by one fall to nil. This was to be Kendos first of many televised appearances which although periodic would continue until ITV wrestled was removed from television in 1988 in which he wrestled such stars as Bruno Elrington, Colin Joynson, Prince Kumali, John Cox, Gwyn Davies, Johnny Kincaid, Billy Howes, Shirley Crabtree, Marty Jones, Pete Roberts, Lee Bronson to name but a few. On the 31st July 1971 in a bout aired from Catterick the public were to get their first glimpse of Kendo unmasked when, in a contest against Bristols Billy Howes, the mask was removed, millions of television viewers saw, albeit briefly, Kendo without his mask before he fled to the dressing room but if anything this just made Kendo even more famous and his presence was required not only in the UK but around the World. Although Kendo was booed by the fans he had a vast and loyal following which continued to grow no matter what happened in the ring. A few months after the unmasking Kendo introduced the World to a man who would be at his side for many years to come in the form of George Gillette, a man whose dress sense would give Adrian Street a run for his money. George would soon become as famous as Kendo introducing himself to the crowd before Kendos bouts and working the crowd into a frenzy even before any wrestling action would begin, George was a good addition to the Kendo camp and the two men worked well together. For the first part of 1972 Kendo and George jetted off to Canada and America issuing an open challenge to anyone who wished to meet Kendo in the ring, and as expected Kendo was victorious in these bouts, a huge star in the UK had now become a star across the pond as well as Japan where he wrestled as Mr Guillotine some years earlier. On returning to Joint Promotions Kendos next challenge was in the form of 25 stone Shirley Crabtree (who later went on to become one of the UKs biggest stars as Big Daddy). 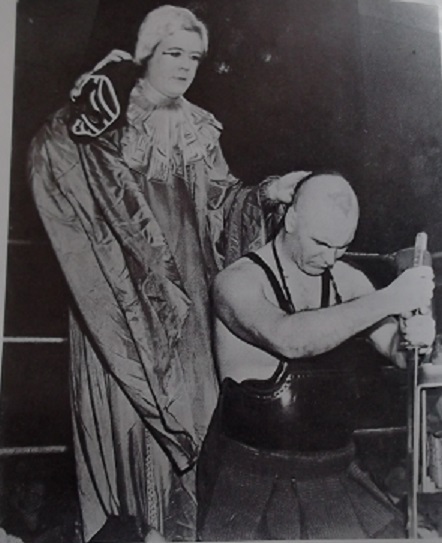 Nagasaki and Crabtree wrestled all around the UK with Nagasaki being the victor on the majority of occasions. The two men topped the bill for several months before Kendo, who at this time was getting limited television coverage, decided to move to independent promoters. Unfortunately for Kendo this did not really work out for him and in 1974 he returned to Joint Promotions where he continued with his feud with Crabtree (who was now wrestling as Big Daddy). In a bout aired on television on the 6thDecember 1975 from Solihull this was to be the second time that Kendo was to be unmasked in the ring when during the bout Daddy tore the mask from Kendos head. However, despite this Kendo won the bout and the two men continued to feud until Daddy turned his attention to Giant Haystacks and the feud ended. 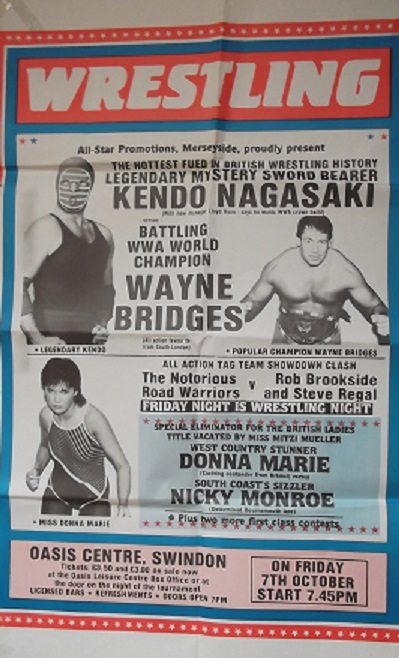 Kendo remained in the UK and continued to top the bill but then in a show broadcast from the Civic Hall in Wolverhampton on the 31st December 1977 one of the most historic events ever in British Wrestling occurred when in a segment shown on ITVs World of Sport Kendo Nagasaki did the unthinkable when he voluntarily removed the mask in front of a sold out crowd and millions of viewers around the UK on television. For the first real time everyone got to have a good look at the man of mystery. 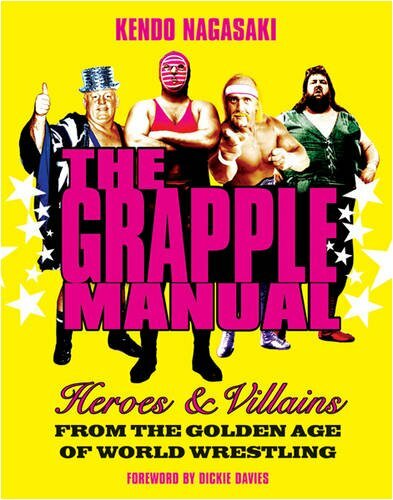 This was a piece of not only wrestling but television gold and something that is still talked about to this day with nothing coming close to the atmosphere in the hall that night. 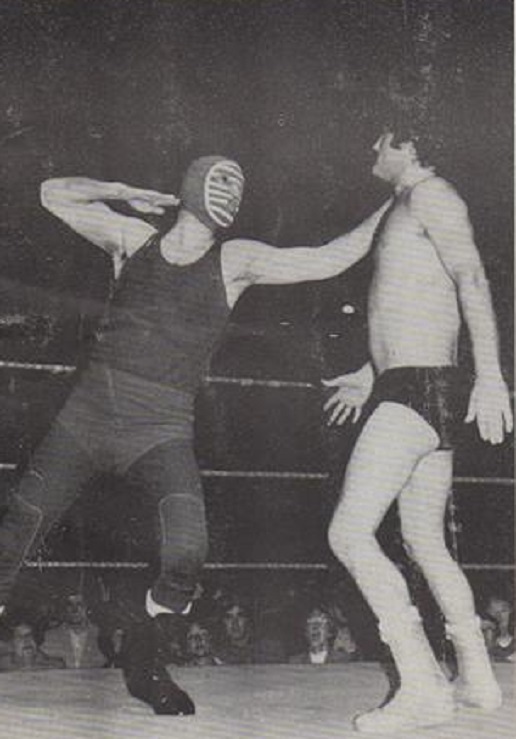 Although Kendo continued to wrestle for a short period without the mask it was announced in September 1978 that he was retiring from in ring action. The wrestling world went into mourning at the thought that one of its major stars would no longer be seen but they need not have worried as a few years later Kendo was to make a return to the ring. 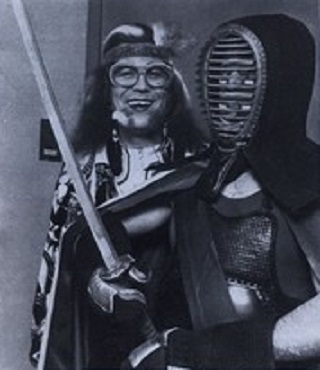 In 1981/82 Kendo returned to the ring, this time under the promotion of Brian Dixon and in which he feuded with what he considered a Kendo imposter in the guise of King Kendo. The two men wrestled around the UK with Nagasaki being the victor until Nagasaki decided that he would once again retire from the ring. 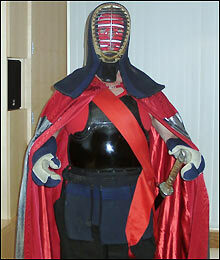 In January 1987 Kendo would make a dramatic return to the ring in a bout aired from the London Hippodrome. Again, Kendo was wrestling for Brian Dixon who had secured part of the ITV wrestling slot from Joint Promotions and along with the likes of Rollerball Rocco, Wayne Bridges, Tony St Clair amongst others were a real challenge to Joint Promotions stronghold on televised wrestling. Kendo was successful in his comeback bout and continued to tour the UK together with George Gillette once again topping the bill wherever he went. In a show broadcast on the 21st November 1987 from Bradford Kendo would enter into a contest that was on a par with that of his feud twenty years earlier with Count Bartelli when he faced WWA Champion Wayne Bridges. On this occasion Nagasaki was successful and defeated Bridges to become World Champion holding the championship until March 1988 when Bridges regained the belt in Cheltenham. 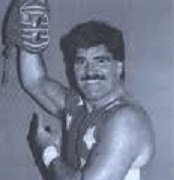 During the best part of 1988 Kendo feuded with Rollerball Rocco, whose father he had wrestled in his very first bout, after the two men fell out during a televised bout broadcast in March 1988 from the Fairfield Halls in Croydon. The two men would carry on this feud for several years and continued to draw good crowds around the UK even after ITV wrestling ended in December 1988. 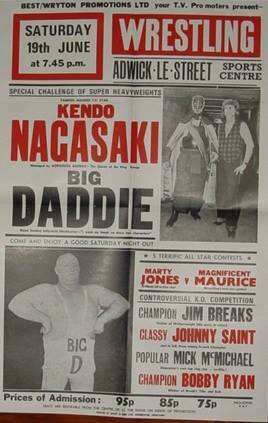 During this time Kendo also teamed up with Bob ‘Blondie’ Barratt and had great success around the UK facing some of the top stars of the day. In 1990 the wrestling world was sad to learn that George Gillette had passed away after managing Kendo for nearly 20 years, the two men had the most successful partnership in the business and it was sad that it had come to an untimely end. Kendo however continued with his in ring action and took on Lloyd Ryan as his Manager, Lloyd a very successful drummer in his own right fitted in well with Kendo and the two men continued with a very successful career. In 1991 Kendo feuded with Giant Haystacks and again sold out halls around the country as these two goliaths of the ring faced each other. By the time 1993 approached Lloyd Ryan and Kendo had had a parting of the ways, Ryan was now managing King Kendo for what was to be another ‘battle of the Kendos’ whilst Nagasaki was managed by his personal assistance Lawrence Stevens. These bouts were however cut short when Nagasaki retired from the ring once again. In May 2000 Kendo returned to the Victoria Hall in Hanley, the scene of his famous unmasking of Count Bartelli, where he accepted the Wrestler of the Millennium Trophy, a great honour and well deserved for a man who has without any doubt been one of this countries biggest ever stars. This appearance would lead to a year of action for Kendo in which he faced such stars as Marty Jones, Darren Walsh and James Mason before once again leaving the limelight behind. In 2007 Kendo made another comeback, this time wrestling exclusively for LDN Wrestling. Kendo remained a hit with not only his loyal fans from the past 40+ years but also a new legion of fans who had heard about the man of mystery but now had the opportunity to witness this huge star in the ring. Kendo battled the likes of Robbie Brookside, Hakan and Travis and many others on the LDN roster before once again announcing his retirement. Todate Kendo has not many any further in ring appearances but never say never. As well as his wrestling career Kendo has appeared in numerous television programmes including the Timeshift Programme, Send in the Girls, a drama for ITV, They Think its all Over, the Danny Baker Show and many others. Kendo has also spent his entire life with spiritual healing and continues to practice this. 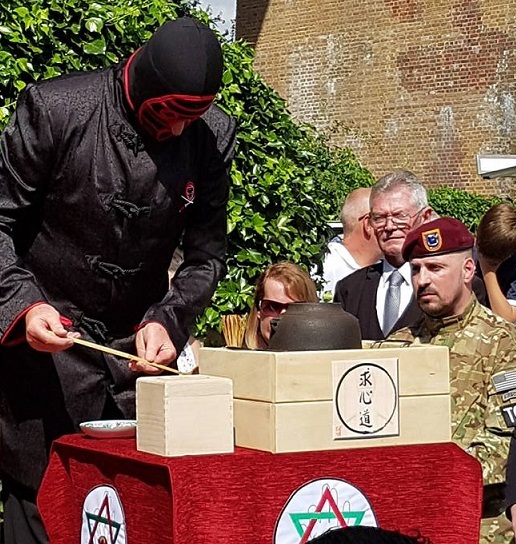 In 2015 Kendo Nagasaki made his first appearance at any wrestling Reunion when he made a rare public appearance in Kent. Such was Kendos popularity that his appearance drew the biggest crowd the Reunion has ever seen and the day was described by many as the best Reunion of all time. Kendo Nagasaki was inducted into the Hall of Fame and was presented with his award by Reunion organiser Frank Rimer. After accepting the award Kendo re-inacted his famous 1977 burning of the mask and thereafter presented the mask to the Reunion. Kendo Nagasaki has more than earned the right to be called a wrestling legend, he will go down in history as one of the most famous wrestlers in not only the UK but around the world and more than deserves his place in the British Wrestlers Hall of Fame.